Swampoodle, a set on Flickr. “Swampoodle" is defined by Philadelphia Neighborhoods and Place Names (www.phila.gov/phils/docs/otherinfo/pname3.htm) as “Junction of three railroad lines in the vicinity of Lehigh Avenue and 22nd Streets.“ This term was supposed to be in common use before 1926. 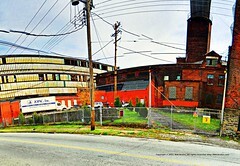 For the purposes of this group, however, the term applies to images of any of the urban industrial ruin, active rail infrastructure, or — most appropriately — the juxtaposition of the two to be found in the Allegheny West neighborhood.